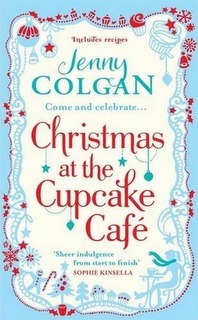 Christmas at the Cupcake Cafe by Jenny Colgan – It's Time to Read! Issy Randall, proud owner of The Cupcake Cafe, is in love and couldn’t be happier. Her new business is thriving and she is surrounded by close friends, even if her cupcake colleagues Pearl and Caroline don’t seem quite as upbeat about the upcoming season of snow and merriment. But when her boyfriend Austin is scouted for a possible move to New York, Issy is forced to face up to the prospect of a long-distance romance. And when the Christmas rush at the cafe – with its increased demand for her delectable creations – begins to take its toll, Issy has to decide what she holds most dear. I really enjoy Jenny Colgan books, and this was no exception. They are light-hearted, predictable, enjoyable chick-lit; which can leave you feeling warm and fuzzy! I had this version as an audiobook, and it was very easy listening. I was quickly drawn into the story, and found myself using every available moment to listen to it. This book is the second in the Cupcake Cafe series. In the first book Issy opens a new cafe – The Cupcake Cafe, and we see her following her dream to make it a success, and fall in love with her bank manager Austin at the same time. We are now a year on, and fast approaching Christmas. But all is not as merry as it should be as Austin is in New York, probably being scouted for a new job out there. Will he go? And will Issy go with him? It seems hard to know where to start with this review – it was just a good read! It won’t take you long to work out the storyline, or even the ending, but I found that didn’t bother me. I liked the characters and I liked the settings. I also like the concept – a novel set in a cupcake cafe, plus this book contains recipes – yummy! My favourite characters were actually the children. I thought Lewis, Pearl’s 4 year old, was adorable. He was kind-hearted and good natured. He seemed to brighten up the room when he entered, and in many ways he reminded me of my little boy. I liked Darny too – Austin’s little brother. He was 11, and he had lost his parents when he was 4 and had been raised by Austin. He was very clever, a bit misunderstood and he pushed all the boundaries. Yet he had a soft side, he really was just a vulnerable little boy. I thought both these boys were very well written. As I have said, this book is fairly predictable, but that didn’t spoil the story for me. I found myself being drawn in – I felt like I was there in the cafe with them. I knew what the outcome would be, but how would we get there? And I loved the setting – New York! I loved it when we went in autumn a few years ago, and it sounded magical at Christmas. This book was the right length for me. As much as I enjoyed it, I wouldn’t have wanted too much more “will they, won’t they”. The only ending I was dissatisfied with was Pearl’s, but who knows – Colgan might write another in the series which resolves that! This book has all the elements expected in a chick-lit novel. It has romance, drama, friendship and a look at family life (plus cupcakes!). This book isn’t a disappointment. This book was fun, it was an easy read (or listen) and it was enjoyable. I can’t say it left me feeling particularly Christmassy, but I do keep thinking about that gingerbread recipe, I definitely need to try it! (It can be found here). This is a genre I really enjoy. It may not be life-changing literature, this book probably isn’t a classic, but I was drawn in and hooked. I am rating this book 4 out of 5.